Just 8 km off the coast from Townsville lies Magnetic Island, often referred to as Maggie by the Townsville locals; a mountainous and thickly wooded 5184ha land mass with approximately 40 km of coastline (23 bays and beaches), 11km at its widest point and rises to 497m at Mount Cook. 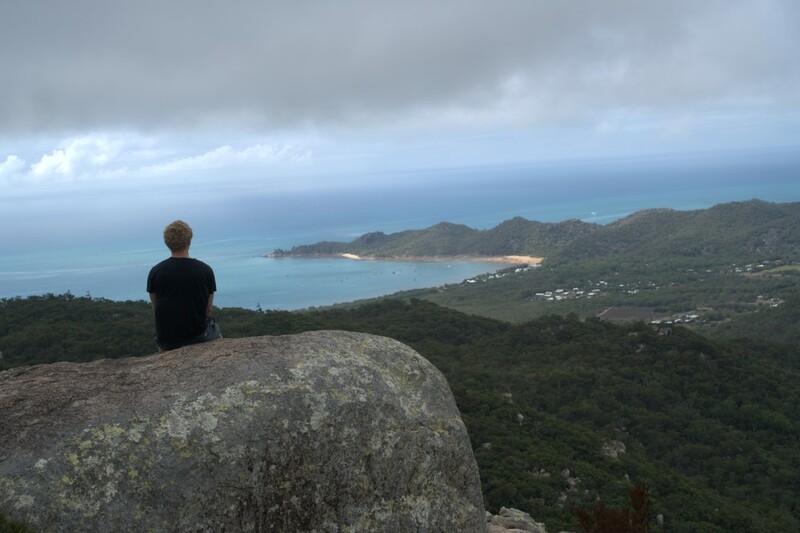 Magnetic Island has over 300 days of sunshine a year and 24 kms national parks walking tracks. The eastern side of the island has four small settlements at Horseshoe Bay (the island's major residential area), Arcadia, Nelly Bay and Picnic Bay. Some 2533 ha of the central area and western side of the island are now national park. Mount Cook is the highest point on the island and the Royal Australian Air Force has an obstruction beacon and helicopter landing pad on the mountain. The island was first discovered by Captain Cook who called it Magnetic Island because he believed that the ores on the island had affected his compass. Cook's concerns seem to have been unjustified as subsequent tests have shown no magnetising qualities in the island's predominantly granite boulders. There are several ways to get up a mountain however Duck Creek is the easiest route which follows the creek all the way to the summit. There also use to be a rough trail to the top in the early 1990s what has been called the 'goat-track' that went up along the ridgeline immediately above upper Gustav Creek. The other main route to Mt Cook's summit is up Gustav Creek (near the pump station) or what is known locally as Rockslides Creek. And of course, the less tackled route is Endeavour Creek via Horseshoe Bay. On this hike you may encounter barbed wine vine (Smilax australis), wild raspberry (Rubus moluccanus), stinging tree (Dendrocnide moroides) and thick ferns. I recommend wearing hiking boots, long pants and a long sleeve shirt. There is not much of a view from the top unless you illegally jump the obstruction beacon's barbed wire fence and climb the tower. As usual, take your rubbish back home with you. The last trip up I found two bottles, a bread clip, and a piece of styrofoam. 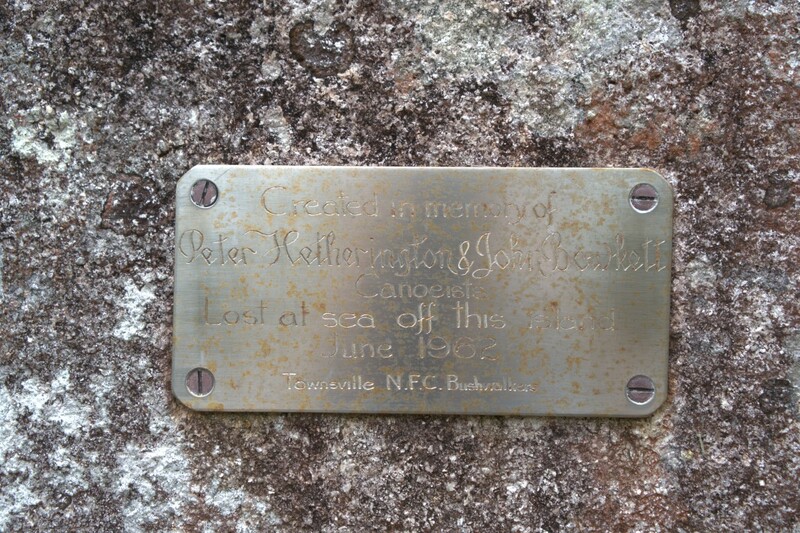 If you have some spare time while at the summit, there is the totem pole to see or the bushwalkers memorial plaque. In 1962, two members of Townsville NFC Bushwalkers (from which Townsville Bushwalking Club arose), also members of the RAAF, set out in a kayak from the Strand for Magnetic Island. They disappeared and were never found, despite an intensive search including two RAAF Neptune maritime patrol aircraft. Their kayak was located days later near Lucinda. The bushwalking club attached a memorial plaque to a rock near Mt Cook looking towards Pallarenda, the plaque facing the line of the airport runway. From the radio tower, follow the star pickets with yellow caps on them to the helicopter landing pad just West of the summit. Once you run into the siam weed quarantine area, hook a left and follow the cut track around the fenced off area. Once past the helicopter landing pad, continue through the Lantana and over to hill 479. Allow a full day return to the summit. It's a 30 minute ferry ride from Townsville to Nelly Bay. Park your car at the SeaLink terminal ($7.50) or along The Strand and purchase a return ticket over to Nelly Bay ($33.50, $16 for a local). The Duck Creek route is a very easy way to summit Mt Cook and is said to be better than the Gustav Creek, a route from Nelly Bay. Starting out on West Point Road and rises steeply up towards Mt Cook, there isn't any overly hard areas to traverse and the vegetation is a lot less thick in the creek so you don't have to bush bash until the end. Either walk all the way from Nelly Bay, catch a bus to Picnic Bay, or take a taxi to near Duck Creek. Follow the creek line all the way to the slopes of Mt Cook, take the right fork in the creek near the end. Once near the top, it's a quick scrub bash up to the summit. The other advantage to the western side is the almost absence of stinging tree (Dendrocnide moroides) and barbed wire vine (Smilax australis) until the slopes of Mt Cook, whereas on the eastern / northern side their there are some large clumps of it leading towards the summit. Anyone who has run into these plants will know how bad they are and why avoiding them is necessary. This route passes through a pocket of rainforest, a small rocky dry creek bed, and climbs gradually to the saddle between The Pinnacles and one of the peaks along the ridge. Start by walking down Nelly Bay Street to the end, follow the Nelly Bay to Arcadia Bay walking track a few hundred meters. You should see a sandy creek running parallel with the walking trail. Cut down into the sandy creek and walk along for a few meters and you will see a rock cairns. Follow the creek up keeping left at the fork. You may want to go right because the creek is more open but stay left! Follow the rock cairns up the creek which opens up into a boulder field. You will soon have a little view and see a few more rock cairns. Watch out for the stinging trees though. Dead and alive stinging trees leaves, when disturbed, can produce fine hair particles and can cause respiratory issues when inhaled. These rocks can be very slippery in the wet so be cautious. When I did this hike last, it was on an overcast day with slight drizzle. Also be sure to watch out for death adders, as they can been seen in the brush. The vegetation start to become more bushy but continue up left to the saddle between the peaks. From here you can make a quick walk up to The Pinnacles and then head over to the summit of Mt Cook. Once in the saddle, take a right and follow the ridgeline up through the sheoaks and grass trees and over a few smaller peaks. Once at the summit, you will see a pole concreted into rock on top of the highest point. There are possibilities to camp at the summit but there's not much of a view. I would prefer camping on the first peak or at The Pinnacles along the way. 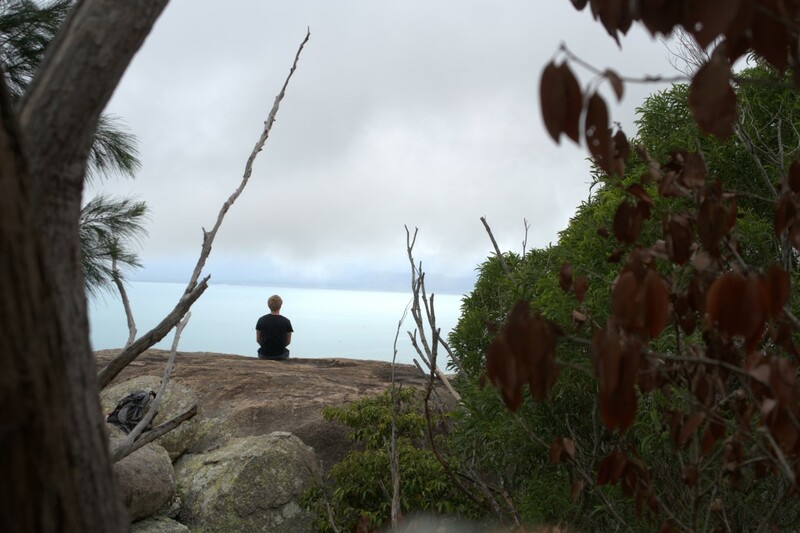 Please note that QPWS do not offer camping permits for Magnetic Island National Park. Start by walking down Nelly Bay Street to the end. This road heads towards the mountains where you will see a boulder field low in the mountain range. Continue down the road into Hideaway Resort and to the creek. This is an interesting and fun climb up via massive boulder. Be careful of loose rocks. From the top of the creek, follow the ridgeline to The Pinnacles or continue over the saddle to another creek and up to Mt Cook. This walk starts on the trail from Nelly Bay to Horseshoe Bay and Arcadia Bay and climbs gradually to the saddle between the Nelly Bay to Horseshoe Bay; On one side is Gustav Creek and the other is Gorge Creek. From here follow the ridgeline to the summit via a few false peaks. Offering views over Horseshoe Bay. Starting on Henry Lawson Street and down into Endeavour Creek. Follow Endeavour Creek up to the summit of Mt Cook. Apparently there's springs 300 meter from the top the has water all year round.